Depending on your personality, the idea of a fresh blank space can be tantalizing or paralyzing. The blank slate, page or canvas--are they ready to hold new ideas or are they simply a huge empty spaces that you somehow have to fill? Do the possibilities inspire you or give you pause? What about an unfinished basement? Many home buyers and builders wisely choose these unfinished spaces as the cheapest square footage you can build, but now you have to decide what you want to do with it! Like most people, "unfinished" can also be code for "storage," "junk holder" or a catch-all for outdated furniture, boxes of out of season clothes, and toys you have yet to take to Goodwill. 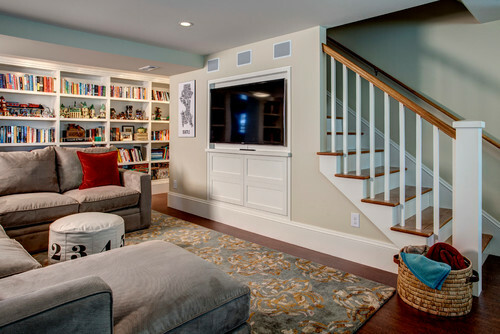 — Kenny Grono, "Contractor Tips: Finishing Your Basement the Right Way"
Our team is taking one family's catch-all into an intentional, beautiful space. As you can see, things are beginning to take shape. Place living areas near the natural light in the basement - this will make the space more inviting for guests, and more usable during the daytime for the family. You may even consider adding windows! 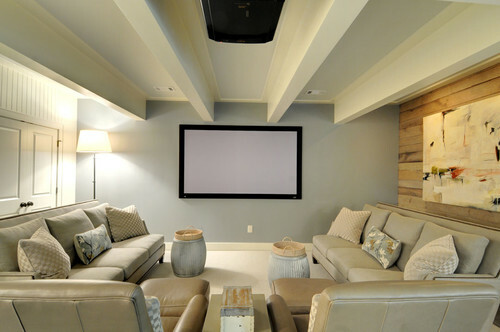 Capitalize on the basement's inherent design, and reserve those interior areas for a media or movie room - as a bonus - no glare on the tv screen! Make sure to have an experienced contractor help you properly check and protect all of your home's infrastructure that already has its home in your basement. This might even be a perfect time to fix a few things (squeaks in your floor joists, anyone!) An experienced remodeler can also help you solve the problems posed by your HVAC system or a support beam. The ideas about what to do with your unfinished space range from basic (drywalls, a few outlets, and light fixtures) to over-the-top (Infected by March Madness? How about a basketball court in your basement?). Here are 6 stunning basement designs that tackle the usual basement problems (low ceilings, no natural light), with style, while creating beautiful spaces you want to enjoy. Details to notice -- uneven ceiling heights and a short wall are just opportunities for these Seattle designers. The flat screen, amazing floor to ceiling built-ins and the cozy yet accommodating sectional make this a perfect place for a family or friends to hang out. 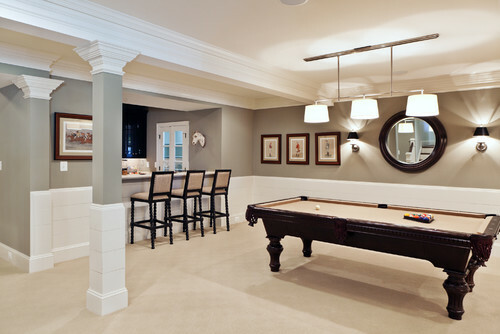 This is not your teenager's game room, but an elegant place to entertain. A clever use of trim helps the ceilings feel spacious, instead of low and cramped. A good mixture of overhead lighting and wall sconces make this basement bright and airy, even without a wall of windows. 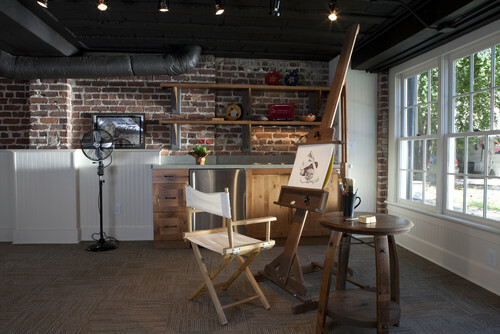 This streamlined studio makes use of one wall of windows to bring in the light. The exposed brick and painted black ceiling give an edgier vibe, while the bead board and beautiful wood tones bring a more traditional feel. The blend is perfect. This kind of space could be used for a yoga studio or hobby room. How about a media room even your wife would be proud of? This sleek, sophisticated room marries the best of a "media" room with all of the style elements from a "living room" -- projector+screen for movie nights, 2 couches and 2 recliners for the most comfortable seats in the house. Who leaves the basement to the kids these days? 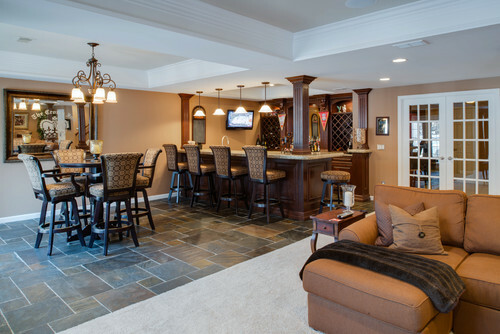 For a grown-up hang out space, consider a mini-pub in your basement. The custom cabinetry, incredible slate flooring, and use of trey ceilings are all smart design choices for this lower level gathering spot. And, if you can't decide -- incorporate all of the ideas into one gorgeous space. 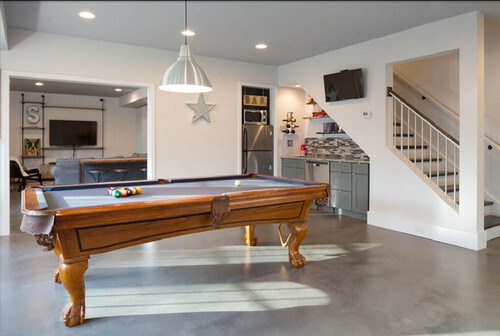 Hang out, watch movies, eat, and play games in a bright basement with polished concrete, clean white finishes that feel fresh, not spare. Ready to take on your blank slate? Starting a new project or just dreaming about one? We'd love to help you get started. Contact us today!